HA NOI (VNS) — Coach Hoang Anh Tuan has finalised a list of 23 players that will make the national U19 football team's roster at the qualifying round for the 2016 AFC U19 Championship in Yangon, Myanmar. 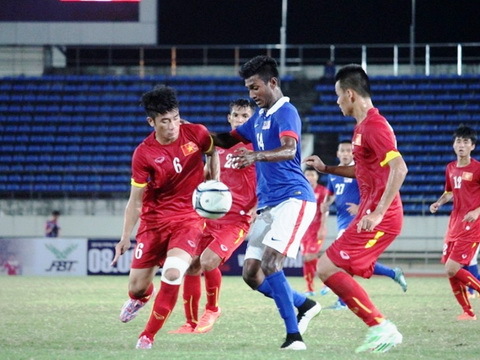 Tuan retained players who were there for the team's silver medal win at the 2015 ASEAN Football Federation's U19 Championships in Laos this September, such as midfielders Phan Thanh Hau, Nguyen Trong Dai and Nguyen Quang Hai. Tuan also called on the 17-year-old striker Nguyen Cong Thanh of Dong Thap. Thanh has appeared in nearly 20 matches with Dong Thap in the national premier league, and scored five goals in this event. The team will leave for Myanmar on Saturday to prepare for their first Group G match against Hong Kong on September 28. Viet Nam will then meet Brunei on October 2, Timor-Leste on October 4 and Myanmar on October 6.